Some people may remember Mike "The Situation" Sorrentino for his wild antics on MTV's "The Jersey Shore," but now the party boy is making headlines for being invaded on tax fraud charges. According to several reports, Sorrentino is being charged for failing to file a personal return in 2011, filing a false corporate return for Situation Nation and concealing his cash income. According to several reports, Sorrentino is being charged for failing to file a personal return in 2011, filing a false corporate return for Situation Nation and concealing his cash income. The reality star's brother Marc was also charged with falsifying records to obstruct a grand jury investigation. 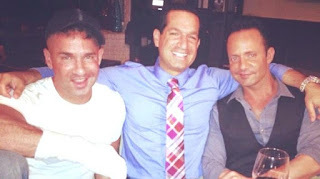 Prosecutors claim that the Sorrentino brothers conspired to evade paying taxes on approximately $8.9 million Mike made from 2010 to 2012. They reportedly filed false tax reports that understated gross receipts, claimed fraudulent business deductions, disguised income payments, and under-reported net business income.